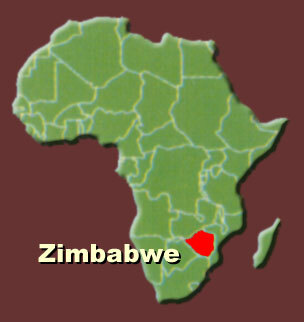 Mbira is a traditional instrument of the Shona people who have lived in Zimbabwe, Africa from ancient times. The instrument has the ability to contact ancestral souls and spirits (an apparition of a living person) during festivals and ceremonies and is the model for the modern music box. Made of flat keys beaten from iron bars with a hammer, it is attached to a board of wood with either bolts or a wire. This can be seen in the photograph to the right. The keys are played with the thumb as well as the forefinger of the right hand. The mbira is played by both hands at the same time. Outside of Africa, musical instruments with a similar shape are generally referred to as the "thumb piano" or "kalimba." In Africa, however, these instruments are named according to the region and country from which they come. For example, there is a musical instrument of the same style "kalimba" in Tanzania, "Sanza" in Central African Republic and the Congo, and as photographed, the "mbira" (mbira dzavadzimu) in Zimbabwe. The mbira is a very beautiful looking instrument. The comfortable tone gradually changes as the beats surge and repeat. From a session with two mbira players a complicated sound is born that can not be imagined with one player. A major characteristic of mbira is the several bottled caps installed at the bottom. 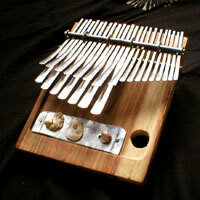 Mbira makers make a hole in the center of a bottled cap and tie it to a board of aluminum. When one plays a key, a unique buzzing or rattling sound comes out. This creates a percussive element to go along with the beautiful sounds of the keys, increasing the energy and spirit of the music. 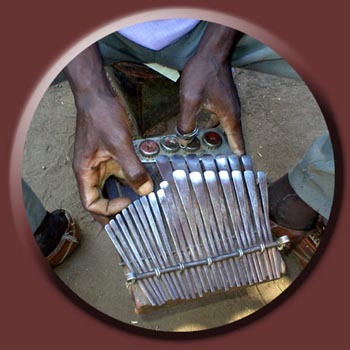 In substitution for a bottled cap, mbira makers sometimes install a bar or a shell. Over the bar goes small cylindrical pieces of metal which create a similar sound to the bottle caps. 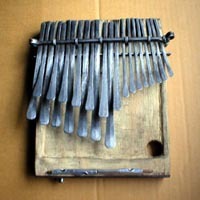 The mbira in the photograph below uses shells, which also emit a buzzing sound similar to the bottle caps. Many of these shells seem to have been used in old days.